Proceedings of the regional workshop on forests for poverty reduction: can community forestry make money? Community forest means an area of state forest subject to an agreement to manage and utilize the forest in a sustainable manner between the cantonment of the Forest Administration and local communities or an organized group of people. Community forestry is initiated and promoted mainly by the various international NGOs and donor agencies, national NGOs, civil society, and later by the Royal Government of Cambodia. The various laws and decrees governing community forestry such as the National Forest Policy Statement (2002), Land Law (2001), Commune Administration Law (2001), Forestry Law (2002), Law on Protected Areas (Draft), Sub-decree on Concession Management Plan (2000), and Community Forestry Sub-decree (Draft), contain conflicting statements. Although the total area managed by community forestry is 55 568 ha, the number of stakeholders and initiatives is 150; thus each covers a relatively small area. With different line agencies involved, the main responsibility is with the Department of Forestry and Wildlife (DFW). 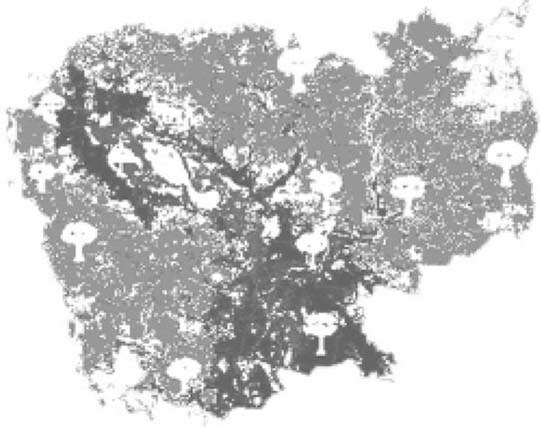 Community forestry only exists at the local level in pilot provinces, mainly linked to projects, with very limited capacity (expertise/knowledge), high inputs by NGOs, being not integrated with other sectors (such as agriculture), importance insufficiently reflected in institutional set-up, and limited extension-research linkages. Current emphasis deals with highly degraded forests which are rehabilitation oriented, use of NTFPs for livelihood improvement, commercial use of timber not yet considered, increasing number of integrated approaches such as the community-based natural resources management (CBNRM), limited benefit sharing arrangements, and good integration into local structures. The Kingdom of Cambodia is one of the smallest countries in Southeast Asia, located in the southwestern part of the Indochina peninsula. The Kingdom lies between 10°-15°N and 102°-108°E. Cambodia shares borders with Thailand, Laos and Vietnam. The area of Cambodia is approximately 181 035 km2. In 1998, the population was approximately 11 million, 85 percent of whom lived in rural areas. The annual growth rate is approximately 2.6 percent. The population is concentrated in the central plain where there is a density of approximately 318 people per km2. On the coastal region, the average population density is 60 persons per km2; in the highlands, the population density is lowest approximately 1 person per km2. Cambodia is rich in natural resources, especially forest resources. Forest resources are one of the most important natural resources for national socio-economic development. Before 1970, a forest inventory implemented by the Forest Research and Education Institute (FREI) reported that the forest cover was 13 227 100 ha or 73 percent of the total territory (Table 1). Over the last 30 years, few forest inventories have been conducted in Cambodia. From 1993 to 1998, the rate of deforestation escalated to approximately 2 million ha per year-the highest rate of deforestation ever recorded in Cambodias history. According to the interpretation of LANSAT satellite imagery (1996/97-UNDP/ FAO), the forest cover of Cambodia is now estimated to be approximately 58 percent (Table 2). The principal direct causes of deforestation in Cambodia are extensive commercial forest exploitation and agriculture expansion. Inappropriate resource use, uncertain resource tenure and rapid population growth also contribute to the destruction of forest resources. Economic, social, and political forces, manifested in policy failures such as poor land-use planning, population pressure and poverty drive these factors. At present, rural people need forest resources to maintain and improve their living standards and to meet their cultural needs. The Department of Forestry and Wildlife (DFW) has responsibility for forest management and recognizes the importance of working with communities to meet the needs of rural Cambodians and to achieve sustainable management of forest resources. Traditional/customary uses of forest resources have been practised for decades in Cambodia especially by the hill tribes in the uplands (e.g. Ratanakiri, Mondulkiri and Stung Treng provinces). Community forestry initiatives have been made by international NGOs (Mennonite Central Committee [MCC], Concern Worldwide, FAO) in collaboration with the Department of Forestry and Wildlife (DFW) since 1990 in a few provinces such as Takeo, K Chhnang, Pursat and Siem Reap Provinces. The Community Forestry Network Meeting was established by the Cambodia Environment Management Project (CEMP) in 1996 and involves government institutions for the purpose of exchange and sharing information and experiences in community forestry practice. Since 1996, the Community Forestry Sub-decree (CFSD) has been drafted by the Department of Forestry and Wildlife and submitted to the Ministry of Agriculture Forestry and Fishery (MAFF) and Council Minister, but it was rejected to be revised. This was done by a working group, in consultation with all relevant institutions and organizations, and the local communities. This draft CFSD was then resubmitted to the MAFF and Council Minister for approval. The Community Forestry Working Group was initiated by the Sustainable Management of Resources in the Lower Mekong Basin Project (SMRP-MRC/GTZ) in 1998 to facilitate the implementation of various activities, and to assist in the policy and technical development to ensure that CF implementation has legal support in the field and also to exchange information among stakeholders. The National Community Forestry Strategic Plan and Community Forestry Guidelines have been elaborated by the members of the Community Forestry Working Group since 2000 and have received funding from the Asian Development Bank (ADB). An interinstitutional training team, the Cambodia Community Forestry Training Team (CAMCOFTT), was established in 1998, and involved the Ministry of Environment, MAFF, Royal University of Agriculture and Concern Worldwide to train community forestry practitioners and government staff. It ceased operation in 2001. Since 2002, JICA has supported a Capacity Building Forestry Centre, using community forestry concepts as important criteria for building awareness to the key staff at the provincial level. By August, two out of the three courses planned for 2003 have been conducted. Community forest management planning has been discussed with all relevant stakeholders in a national workshop in 2002 to elaborate the management planning procedures and technical tools. Other legislations under the Community Forestry Sub-Decree are being developed by the Community Forestry Unit involving all stakeholders. Since 1990, 150 community forestry units have been established in 344 villages, 96 communes and 55 districts in 15 provinces to manage and use the forest resource sustainably. All these cover a forest area about 55 568 ha under the jurisdiction of the DFW/MAFF. The local communities have organized community forestry committees, formulated regulations and developed management plans, but some units have not completed all these processes. Government institutions, NGOs and some international agencies provided technical advice. Although community forestry initiatives are expanding in the country, only one unit, that of Takeo Province has been recognized and approved by the DFW and MAFF; all the others have only received recognition from the Provincial Forestry Office (Table 3). Community forestry initiatives are still very much driven by international donor organizations, international and national NGOs, but recently communities are becoming more proactive, using direct approaches to address local problems. However, central level commitment expressed in policy documents has fallen short in practice (slack law enforcement), but commitments set from provincial authorities/governors remains crucial to the success of these initiatives. A comprehensive collection of information is available (e.g. case studies, reports, assessments), but so far there have been no conceptual synopsis that could be used for extension packages based on categories-uplands, lowlands and coastal zones. Community forestry has to take the needs of the resource users into consideration; therefore applied approaches/tools have to be flexible, realistic, practical, simple, independent and participatory. The government has framed policies such as the Interim Poverty Reduction Strategy and the National Economic Development Plan, where emphasis is given to sustainable management of natural resources for micro- and macrosocio-economic development of the country. More specific policies are the National Forest Sector Policy Statement (2002) and the Strategy of Land Policy Framework (2002). The legal framework for community forestry is provided by the Constitution (1993), Environmental Protection and Natural Resource Management Law (1996), Royal Decree on Creation and Designation of Protected Areas (1993), Forest Concession Sub-decree (2000), Land Law (2001), Commune Administration Law (2001), Forestry Law (2002), and the Community Forestry Sub-decree (Draft). The legal framework recognizes decentralized forest management by communities and their customary rights to use forest resources. Yet it is still fragmented and inconsistent with conflicting statements in different legislatives. Unclear issues are taxation, benefit sharing, co-management, prakas needed for forest management planning, inventory procedures and approaches. The real commitment at the policy-making level is questionable, as the Community Forestry Subdecree elaborated with participation of all major stakeholders and based on common consensus has been revised significantly. Decentralization efforts of the government related to natural resource management are supported by the SEILA Programme to integrate and mainstream natural resource and environmental management into general decentralized planning framework and to support a balanced socio-economic development process. Emphasis is given to the strengthening of local structures and planning capacities (commune level) through intersectoral facilitation teams to integrate and address natural resource and environmental issues into their general planning process, based on experiences from CBNRM initiatives (e.g. Ratanakiri). The concept of land-use planning was introduced in 1999. Progress was also seen in the elaboration of a participatory land-use planning manual supported by SMRP/LMP. Support to the DLMUPC in organizing and conducting participatory land-use planning training for trainers has been initiated in ten provinces since 2002, but the implementation of such practices is still limited to two pilot provinces. Participatory land-use planning is essential to facilitate the process of land registration, resolve and avoid land conflicts, and facilitate participatory decisions on land uses as a basis for sustainable NRM. An eight-step approach gives guidance to local authorities, especially commune councils. The Land Management Project (LMP) supports land policy development, systematic land registration according to the Land Law, and development of guidelines and procedures. "To promote participatory processes among stakeholders in the management of forest resources as a means to contribute to decentralization, poverty reduction and sustainable forest management". to improve collaboration between community forestry and broader natural resource management initiatives. provide a forum for gaining consensus in decision-making among all stakeholders. arrange study tours with a focus on policy-makers, but including other stakeholders, initially within Cambodia, and later within the region. participate in the development and maintenance of the community forestry/natural resource management database. provide implementing structures to develop guidelines/manuals for community forestry activities such as mapping, inventory, benefit sharing, agreements, forest management practices (thinning, pruning, harvesting, planting, etc. ), forest management planning, monitoring and evaluation. establish links to regional community forestry networks (such as RECOFTC, AFN, IIRR) and regional country networks. support the inclusion of CF activities within commune development plans. The Cambodia Environment Management Project (CEMP) established the Community Forestry Network Meeting in Cambodia (CFNC) in 1993. When the CEMP was closed in 1997, the DFW/MAFF, MoE and Concern Worldwide continued to support and facilitate the CFNC. For some time there have been concerns over the ownership and future direction of the Community Forestry Network Meeting. Concern Worldwide and WWF organized the meeting with a range of stakeholders to discuss networking in CBNRM and map the existing networks and their relationships and several constraints and opportunities were identified. Following this meeting, there was a proposal that the network should have an organizing committee who would also have responsibility for the content of the Community Forestry Newsletter. This idea was presented at the Community Forestry Network Meeting and broad agreement was reached. The organizing committee has since met once and currently includes representatives from CFU/DFW/MAFF, MoE, WWF, Concern Worldwide, Oxfam GB and Mlup Baitong. Objective of the CFNC: To share information and experiences among community forestry agencies, communities and NGOs regarding community forestry in Cambodia. Ownership: The CFNC rotates every six months between the two departments, CFU/DFW/MAFF and MoE. These departments will take turns to be the chairman and treasurer. Since the establishment of community forestry networking at national level, some provinces such as Pursat and Kampong Chhnang have also initiated to organize meetings at the provincial level. The provincial Department of Agriculture Forestry and Fishery plays the role of chairman and all organizations that are interested in community forestry activities (relevant institutions and representatives of community forestry committees in the provinces) are involved. The meetings are for exchanging and sharing information and also announcing new legislations and technical lessons learned from national or international meetings. In a post-conflict country like Cambodia, the military still plays a major role in forest resource use; the influence of "powerful men" acting beyond the laws weakens the enforcement of law. Very often, overlapping land uses cause conflicts between land concessionaires and traditional resource users. The concessionaires often deny the people their customary resource use rights. There is also confusion on land tenure in practice because of very limited implementation still of a systematic land-use planning or land allocation process. Mistrust between forestry officials and the local communities arises because of past top-down management of resources. The government has yet to introduce feasible financing mechanisms such as incentives in the forms of tax exemptions, secure ownership, reduction of royalties and benefit -sharing arrangements for community forestry, especially for extension of the rehabilitation/reforestation activities. 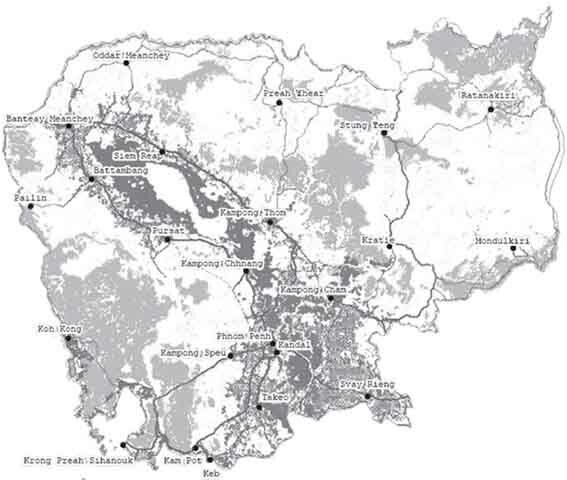 villages-villages: overlapping resource use, unclear village territories and encroachments. Community forestry is initiated and promoted by various international NGOs and donor agencies, national NGOs, local communities and the government. One hundred and fifty community forestry units covering a forest area of about 55 568 ha have been established involving local communities and diverse stakeholders. The incentives from the involvement of the local communities in community forest management plans relate to the commercial use of NTFPs for their livelihood which ensures that the forest is sustainable. The development of community forestry policy has involved multi-stakeholders and community forestry working groups and representatives of local communities.